We and the bees appreciate those that allow weeds like clover and dandelion to grow in their yard. An added bonus to letting these weeds thrive is the potential for other beneficial plants to grow as well! 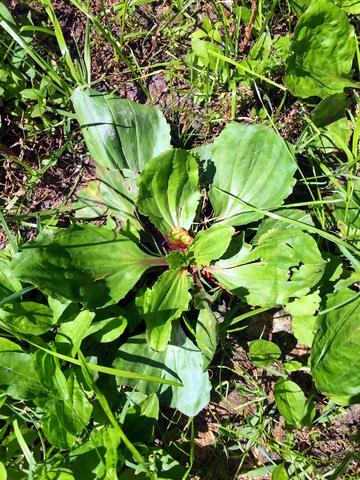 In this case we are specifically looking for a wondrous little plant called plantain (plantago major). Now this isn’t the plantain that looks like a banana and is great with guacamole. What we are looking for is a broad leaf flowering plant that you can find just about anywhere. In fact it is one of the most abundant medicinal plants in the world! The leaves of plantain are highly nutritious and edible, though younger leaves are recommended for raw consumption. The tougher older leaves can be boiled or steeped to make tea. Plantain is high in Vitamins C, K and A and also contain aucubin (anti-microbial) and mucilage (reduces pain). This plant also has astringent properties (due to its high concentration of tannins) and is used to treat digestive tract issues. Quite often people ask if I get stung working with bees and the answer is YES! But to be honest I really don’t get stung that regularly. When a honey bee does decide to make the ultimate sacrifice and sting it still hurts and occasionally I get some swelling depending on the sting location. If I have the opportunity I will grab a plantain leaf, chew it up, then spit it out on the sting site. It definitely helps with the pain and even seems to have some effect on the swelling. I try to leave it on the site for 15 minutes if convenient. The astringent properties of plantain draw the skin together to help with swelling while the mucilage provides pain relief. 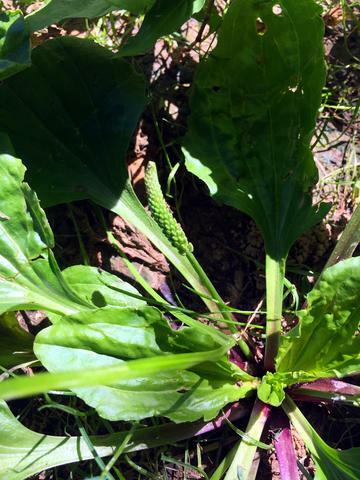 So the next time you get stung look around for some plantain, grab a leaf, chew it up and apply! If the thought of applying chewed up leaf bits to your skin or the skin of your loved ones (it could get weird with a stranger) makes you queasy, then just mash up a leaf as best you can in your fingers and smear it on the site of the sting or bite (be sure to properly remove the stinger first!). If you want to know more about the power of this plant there are quite a few good online posts about it’s benefits. It’s another amazing wonder of nature! Subscribe to our mailing list and let us teach you about the amazing honey bee and how to incorporate all of it’s wellness benefits into your life. Plus you’ll be the first to receive sweet deals!